I want to put together a full setup for my TRF radio and I want to include the batteries. I need to know which ones they may have used and I would need to find dimensions and pictures like to make mock-ups of them. I'm assuming your referring to the 1920s TRF battery operated radios. Would your quest include having an authentic or mock up 6 volt lead acid car/radio battery for the filament current supply? That might include a trickle charger with your setup. Maybe a 1920s A battery eliminator would be just as good to use. At least it would be historically accurate. Here is my mid 20s Kingston A power supply that I restored a few years ago. I use it on my larger 1920s superhets. The B Battery eliminators are quite common. However, the A battery eliminators are fairly illusive creatures! Never fully understood why this is being the A batteries were depleted fairly quick compared to the B batteries. I think it's because you could always recharge the A battery while the B batteries needed replacing once they became depleted. I am curious about the B eliminators, as I find that the HT is usually way too high when powering 1-3 valve sets. These are not regulated units usually. Presumably they are made for specific sets, or a certain set of valves. I have several, marked 40 - 60 - 80 - 120 or thereabouts, but when I've measured output it can start at 120! I guess a way around it is to add droppers. 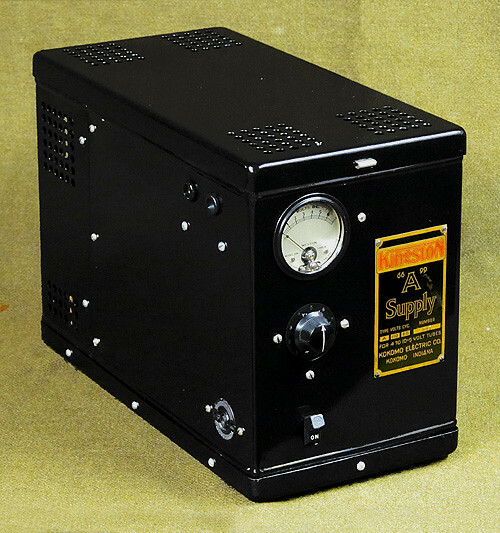 Most vintage "B" eliminators used the BH gas rectifier. It imparts a small amount of regulation. Some eliminators had a HI/LO selector and almost all used carbon pile voltage pots. The output could always be strapped with a shunt resistor if need be. The Majestic eliminator are about the easiest to rebuild, if done with poly caps will have an infinite life. Good BH tubes are hard to find, they used helium gas and the gas is prone to leak out. A substitute diode can be used. Common use in the era was to attach the eliminator and twiddle the B+ and DET. voltages until it sounded good. More common "A" set-up was a 6 volt 60-80 AH L/A battery and the carbon/zinc "C" & "B"B batteries. When an eliminator for the "B" was used, a relay that the activating coil was in series with the "A" battery was used to transfer the AC power for the trickle charger to the "B" battery eliminator. During the 20's my father and his brother would make installations like this type with an extended battery cable through the first floor to a shelf in the cellar. All the power sources were placed on the shelf so the acid fumes and other unattractive bits were out of sight. FWIW "B" batteries came in many versions but were offered in three groups, portable made with "C" cells. Standard duty, made with "D" cells and heavy duty made with "F" cells. As noted the small batteries were for portable sets, standard duty for any home set up to 6 tubes. The heavy duty for the 7 and greater tube radios. It is all about the plate current v.s. life of the battery. Some "A" batteries were brought into service that had been designed for flashlights, these were a stacked "D" cell and the #6 telephone cell. In the waining years of home battery sets new battery designs used a layer cell construction. These proved unique as the zinc could be totally consumed as it was not a can that could perforate and dry out.... There are other variations including batteries that are tapped for the enthusiast to select the ideal detector voltage. Search online for the many battery box construction projects that are out there. Many brands of batteries have been scanned and there images are offered for those who wish to cover the battery case with new, old art.